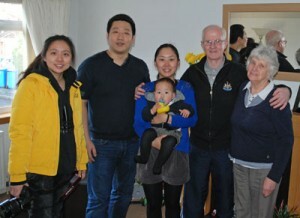 Peng Chen and his wife TianTian Sun travelled for 24 hours with their 10-month old daughter Ginny in February to attend the course being held at Inverkeithing High School. They are pictured here with their STA Course Tutor Tom Gray and his wife Cecilia after they had successfully passed their practical and theory exam. Tom said: “Both Peng and TianTian intend to start up BPC lessons as soon as they can get a pool that is suitable, which is not easy in their area they live but they are more than determined to make it work.